5 Bedroom, 4.5 Bath home with reverse floor plan. 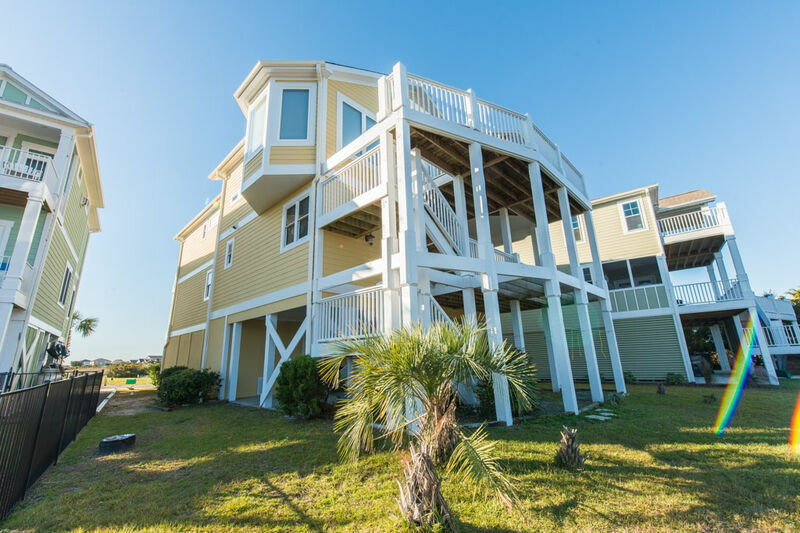 Breathtaking 180 degree views of the east end marsh and Intracoastal Waterway to the Shallotte inlet. Top floor open living space, large flat panel TV, DVD, fully equipped kitchen with granite countertops and gas cooktop. Hardwood floors throughout. Elevator to all floors. Flat screen TVs in all bedrooms plus Hulu and Netflix and WiFi. Covered and uncovered furnished porches. Pool shared by small community of homes; outside shower is located at the pool. Renter will have use of community boat dock for loading and unloading passengers during high tide only. Boats can be launched from the public access at the OIB bridge. Boats with trailer can be parked on the rental property. Overnight docking at the floating dock is not permissible. A fixed dock is available for overnight docking, but depth of slip is not guaranteed. Will need transportation (bike, golf cart, car) to get to the beach easily. Non-smoking. No pets. Beds made upon your arrival and bath linens provided. Accommodates 12. Bedding: Upstairs: 1 King Downstairs:1 King, Queen, Queen, 2 Singles, 1 Sleeper Sofa.5 Bedroom, 4.5 Bath home with reverse floor plan. Breathtaking 180 degree views of the east end marsh and Intracoastal Waterway to the Shallotte inlet. Top floor open living space, large flat panel TV, DVD, fully equipped kitchen with granite countertops and gas cooktop. Hardwood floors throughout. Elevator to all floors. Flat screen TVs in all bedrooms plus Hulu and Netflix and WiFi. Covered and uncovered furnished porches. Pool shared by small community of homes; outside shower is located at the pool. Renter will have use of community boat dock for loading and unloading passengers during high tide only. Boats can be launched from the public access at the OIB bridge. Boats with trailer can be parked on the rental property. Overnight docking at the floating dock is not permissible. A fixed dock is available for overnight docking, but depth of slip is not guaranteed. Will need transportation (bike, golf cart, car) to get to the beach easily.